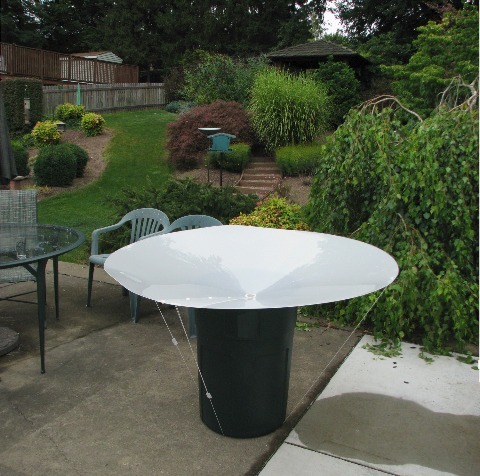 "Tom, finally got a chance to set up one of my two rainsaucers. Assembly time was less than ten minutes. The attached picture shows its location relative to other objects, to avoid "splashwater." ...I did not accurately measure the rainfall last night, but the level of rainwater in a glass that I put out to approximate it indicated about 0.8 inches of rain. I measured the water collected, and found 22 quarts (5.5 gallons). The water pH measured (average) 5.6 (I'm surprised it was not lower, here in industrial western Pennsylvania), and the TDS was in the mid-twenties. Taste was a little "plasticky," but I that's probably because this was the first time that I had used those Rubbermaid 55-gallon barrels (I bought two, but only used the one I had washed out for this trial). Only one small unidentified fragment of solid, about one mm in diameter, was found on the coarse filter in the center of the saucer after the rain. Takedown was very easy, and I wiped both sides of the saucer surface with a dilute aqueous solution of Clorox and GSE, before re-hanging it in the basement. The fasteners were very easy to remove, and their reusable design is impressive. If you have any further questions, please do not hesitate to email me: you have a great product, and your website is remarkably helpful and informative. Thanks, again, and I wish you well…"